As a service connected veteran and military family. 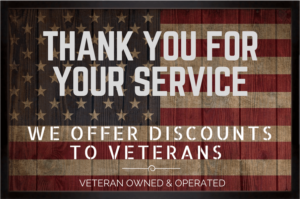 Bell Family Dispensary holds deep gratitude for all current and former military service members and offers an unlimited 20% OFF full-price retail orders to all veterans. To apply, Login to your account, or Register for an account if you don’t already have one. Fill out our Veterans Discount Form and please provide us with your DD214, Military ID, or VA card. Please obscure or black out any sensitive information such as your SSN if applicable. Please allow 3 days for processing and approval. Discounts will not be applied to previous orders. If approved you will receive discounts on all products when you’re logged in! To apply, Login to your account, or Click Here to Register for an account.